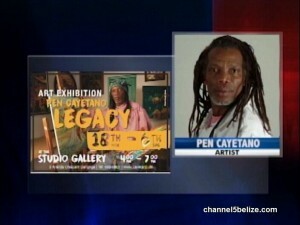 Pen Cayetano wants to share the Garifuna culture with Belizeans this nineteenth. The renowned artist is opening an exhibition called ‘Legacy’ at his gallery in Dangriga. 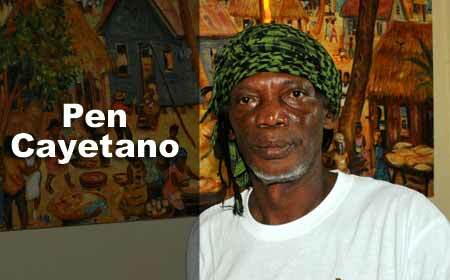 The collection of paintings will show different aspect of the Garifuna people. Cayetano told us about what you can expect from these new pieces in his latest art show. The exhibition opens on Saturday, November eighteenth at four p.m. and will run through to December sixth at Pen Cayetano Studio Gallery in Dangriga. Some of the paintings will be available for sale. Shortly after 4:00 p.m., beneath a brilliant Dangriga sky, the artist Pen Cayetano climbed on the stage in his yard. Some of his guests were already seated. Two very young boys sat with their drums between their legs, waiting. The drums came to life as Pen Cayetano broke out in song. After singing in Garifuna, he addressed his audience, telling them about a part of the journey that he has made in becoming an artist. Pen Cayetano said it was very hard to be an artist down here. “People used to say to me, ‘Hey man, why you noh goh work, find a job and do something. Yu to idle.’ So I went all the way from here to Corozal to look for a job, and I found a job to cut cane,” he related. “Cutting cane wasn’t so easy to do. I used to cut cane from morning to afternoon, and when my pay came it was only $24 for two weeks. So I decided not to cut the cane. I decided to load the cane this time. Loading the cane was another disaster for me. One of the hardest times, was to load the cane around midday when the sun was hot, hot like fire. I didn’t know if I was in heaven or hell. That cane was no joke. So I decided to go back to my art and began painting on the seaside of Corozal for many, many months,” said Cayetano. “So how could I live painting these pictures that nobody was buying? Today, ladies and gentlemen, this art world has changed. That was the way I started out. Today, I am an artist from Dangriga. More music ma boy,” Pen Cayetano said, as the drummers hit the skins and he broke out into another Garifuna song. Pen Cayetano, after singing, introduced Dr. Michael Benjamin, an African-American historian to the audience. Dr. Benjamin first visited Belize five years ago and has been studying the relationship between an African people named the Gullah people and the Garifuna. The Gullah people are an ethnic group living in the southeastern United States whose culture bears striking similarities to that of the Garifuna people. “The Gullah people, like the Garifuna people have their origins in Africa. They live along the coast of South Carolina and they speak their own African language, very much like they did a long time ago in Africa. The Gullah arrived in the US in 1670. The Gullahs were enslaved, but they were not slaves. They resisted their enslavement. Like the Garifuna, the Gullah people were very skilled in craft making,” Dr. Benjamin said during a PowerPoint presentation in which he showed photographs of the Gullah people, and outlined similarities with the Garifuna people. Following Dr. Benjamin’s brief address, Pen Cayetano and some of those attending the opening of the art exhibition moved to the studio gallery where the paintings were displayed. Pen Cayetano and Dr. Benjamin cut the ribbon, declaring the exhibition opened. Pen Cayetano explained to Amandala that when we talk of the Legacy of the Garifuna people we are talking about the legacy that the Garifuna have had here from original times. 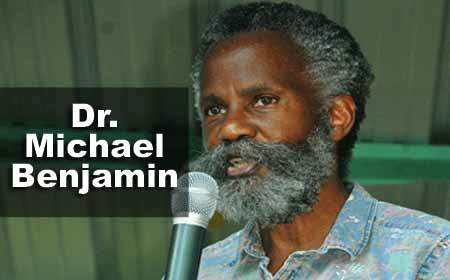 “The legacy is from the things that have remained from the Garifuna people since they came here,” he explained. The Legacy of the Garifuna People consists of 30 paintings depicting various aspects of the Garifuna culture. “The exhibition will be going on until December 26,” Pen Cayetano said. In the exhibition, there is a painting about the Jankunu dance, which is a ritual of the Garifuna people signifying the homecoming of the warriors and the ceremony of them picking their wives, Pen Cayetano explained. “These guys would come with their spear or shield and shake it in front of the girl they love,” he said. One painting depicts the Beluria, which is a celebration of someone’s death and the good that the person has done in life. Among the other paintings are one depicting some men climbing a coconut tree, one depicting women washing their clothing at the riverside, one showing women baking bread, and one showing a man sharpening his machete to go to work. Pen Cayetano explained that all the paintings in the exhibition are for sale.